A Laois goal in the 3rd minute from full forward Gary Walsh kept John Sugrue's side in credit throughout this scrappy Round 7 NFL Division 4 tie at Netwatch Cullen Park, as they claimed the local bragging rights over neighbours Carlow before an attendance of 4,000. Into the bargain this outcome jettisoned Carlow's 100 per cent league record and leaves Laois as the only county with full league points over the four divisions. Their final game against Antrim is now deemed redundant. From the throw-in Laois gained possession and retained unbroken possession for some three minutes before finally piercing the home defence, allowing Walsh to find the corner of the Carlow net. Laois were the superior force for most of the opening half as the early goal unsettled Turlough O'Brien's men. Carlow adopted their usual massed defensive style but with so many players committed to defence found it very difficult to put any significant pressure on the Laois rearguard. With scores at an absolute premium, Laois went into 1-4 to 0-2 lead by the 26th minute. For the remainder of the half Carlow showed improvement with midfielders Brendan Murphy and Sean Murphy gaining a degree of control over a strong Laois pairing of John O'Loughlin and Kieran Lillis. At half time Laois led 1-05 to 0-05. The second half was a dreary affair as Carlow recorded three points to a single Laois point from a free by Donie Kingston on 67 minutes. The home side had one great chance of a goal from substitute Jordan Morrissey but he opted to punch the ball across the face of goal when a shooting opportunity was a better option. Try as they might Carlow could not gain parity, despite the fact that Laois were reduced to 14 men early in the second half when midfielder Kieran Lillis was issued with a second yellow card. There was a helter skelter finish to the game with Carlow trailing by a point and seeking to retain their unbeaten league status. But when a melee developed deep in the five minutes of injury time, referee Fergal Smith threw up the ball and when Donie Kingston gained possession the final whistle sounded. These counties will clash again in the Division 4 final which is expected go ahead next week-end. 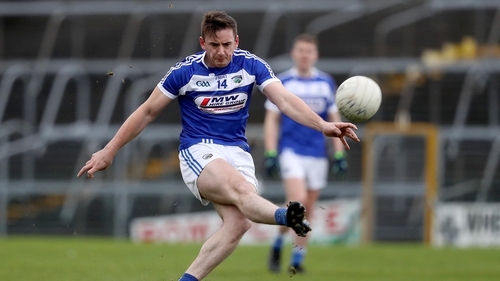 Laois: G Brody; S Attride, M Timmons, G Dillon; T Collins, C Begley, R Piggott; J O'Loughlin, K Lillis; A Farrell (0-01), B Carroll, B Glynn; E O'Carroll, G Walsh (1-03, 0-02f), D Kingston (0-02, 0-01f). Subs: D Strong for Piggott (30); E Lowry for Walsh (50); D O'Reillly for Carroll (56); R Munnelly for Glynn (61). Carlow: C Kearney; C Crowley, S Redmond, C Lawlor; D Moran, D St Ledger, C Moran; B Murphy, S Murphy; S Gannon, D Foley, E Ruth; P Broderick (0-08, 0-06f), D O'Brien, J Murphy. Subs: M Rennick for Crowley (40); J Morrissey for D Moran (40); C Lawler for Ruth (52); B Kavanagh for C Moran (63). Elsewhere in Division 4, Antrim claimed the two points down in Newcastlewest but it ultimately proved immaterial due to events in Carlow. The visitors trailed Limerick by 0-07 to 0-05 at the break but Matthew Fitzpatrick hit the only goal early in the second half and Antrim pushed to seal a four-point victory, winning 1-13 to 0-12 in the end. Antrim are yet to play Laois after their game in O'Moore Park was postponed at the beginning of March due to the weather. That match will now likely not be played as it will make no material difference to the standings in Division 4. Over in Ruislip, Waterford claimed their first competitive win in over a year as they beat London 1-16 to 1-14. They lay bottom of the table on one point at the beginning of the afternoon but the rare win lifts them onto the same points tally as both London and Limerick. Jason Curry's goal midway through the second half proved the decisive score in the end. Leitrim cantered to victory in Carrick-on-Shannon to leave visitors Wicklow stuck to the bottom of Division 4, albeit with one game still unplayed (and likely to remain so). Leitrim led by five points at the break with Keith Beirne's 15th minute goal helping them achieve a clear advantage as the teams trooped down the tunnel. They only built on that advantage in the second half, with Emlyn Mulligan's goal ten minutes from the end opening up a ten-point gap. It was plain sailing from there as Leitrim claimed their second win of the campaign. Wicklow, for their part, haven't managed a win in the 2018 league and owe their two points to draws with Antrim and Waterford.